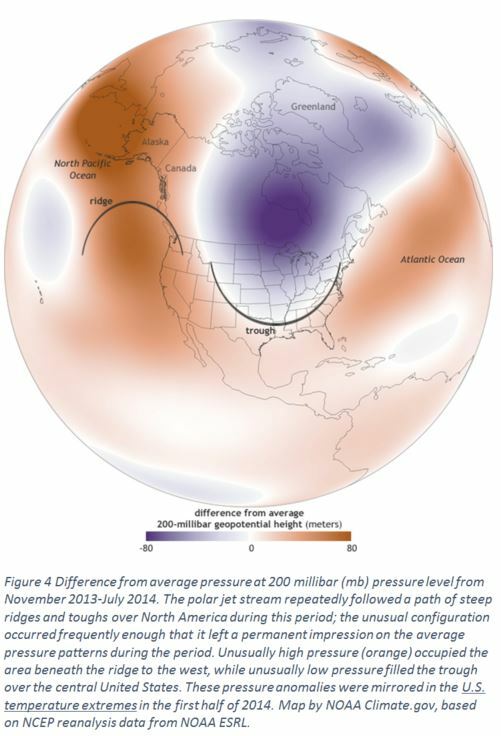 Research Review: Are U.S. Winter Extremes The Result Of Amplified Arctic Warming? The Arctic is warming faster than the rest of the planet in a phenomenon known as ‘polar amplification.’ As reflective ice melts en masse in the Arctic, it exposes the darker, more light-absorbent surfaces of the land and ocean below, compounding the heating effect of fossil-fuel induced warming. And so headlines about extreme warming in the Arctic, complete with heart-wrenching images of starving polar bears and calving icebergs have become commonplace. These headlines come in stark contrast to the particularly cold and snowy winters that the Midwest and eastern United States are enduring this year. It’s not intuitive that the two conditions might be related, but scientific consensus is mounting that winter weather in the U.S. (and other mid-latitude regions) is influenced by amplified warming in the Arctic (Cohen et al. 2014). Sea ice loss, changes in the trajectory and strength of the jet stream, and subsequent interactions between the ocean and atmosphere are all plausible linkages. Arctic sea ice loss contributes to changes in mid-latitude climate through both direct (change in temperature), and indirect (change in circulation patterns) mechanisms. 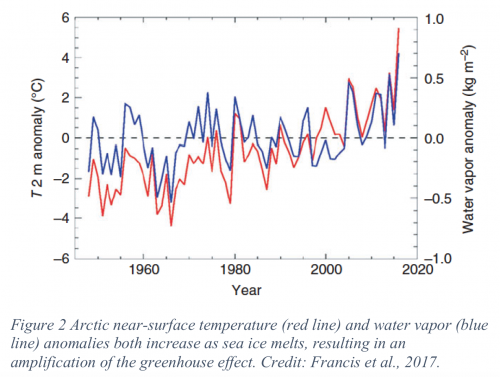 Melting sea ice drives a rise in both near-surface temperature and water vapor anomalies (Figure 2), amplifying the greenhouse effect, as well as increased cloud formation and precipitation. Surface air temperature changes lead to pressure changes in the atmosphere above, impacting Arctic pressure gradients that drive surrounding circulatory winds (Francis et al., 2017) (Figure 3). In a recently published article by Screen and colleagues, based on a 2017 AGCI workshop on Understanding the Causes and Consequences of Polar Amplification, a diversity of models corroborated these trends. The models all show that sea-ice loss results in of semi-permanent pressure system disruptions: intensification of the Aleutian low and the Siberian high, weakening of the Icelandic low, as well as reduced wintertime pressure over North America and the North Atlantic. Screen et al. found that oceans serve as a primary transporter of the effects of sea-ice loss to lower latitudes, underscoring the importance of including a dynamical ocean component in models. 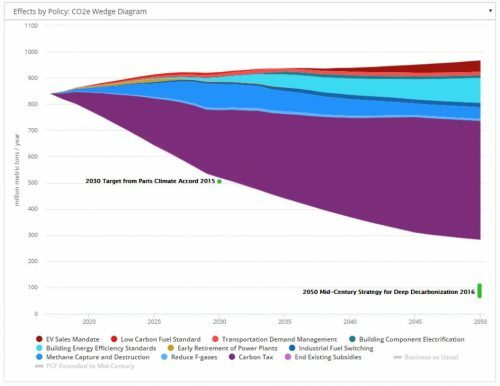 Otherwise, they can miss out on key interactions between polar warming and mid-latitude climate, notably failing to capture a “mini global warming” response to sea-ice loss. The models (and observations) also show an equatorward shift and general weakening of the mid-latitude westerly winds (Screen et al. 2018). This weakening and southward migration of the westerly winds is hypothesized to be linked with a less robust, wavier jet stream, which can drive cold/snowy winters in the Midwest and eastern U.S. (Francis and Vavrus, 2015). Without a strong pressure gradient from mid- to high-latitudes, the jet stream is more prone to meandering – with decreased velocity and higher amplitude waves that create higher than usual ridges over the western U.S., and deeper troughs over the eastern U.S. (Figure 4). Observational evidence from tree rings confirms that the North Atlantic Jet stream has been markedly wavier over the last 50 years than in the previous 300 years (Trouet et al., 2018). With a slower, wavier jet stream, not only are cold pockets from the north more likely to dip into the Midwest and eastern U.S., but those systems are more prone to linger. This same phenomenon can contribute to increased magnitude and persistence of warm, dry winters in the West. Just as deep jet stream troughs bring in low pressure and cold air from the north, high jet stream ridges bring in high pressure and warm air from the south (Figure 4). The persistent ridge along the U.S. West Coast has dramatically increased warm temperature extremes in the West since 1950. These low precipitation, high temperature extremes were highly evident in the recent severe California drought (Swain et al., 2016). Loss of ice in the Arctic is also likely responsible for a change in winter storm tracks, sending winter storms more northward into British Columbia and southern Alaska, resulting in up to a 30 percent precipitation decrease in the western U.S. (Sewall and Sloan, 2004). The fact that the West is so reliant upon snowpack for its annual water supply compounds the significance of this trend. It is important to note that while multiple mechanisms have been identified and supported through models and observations, the cause-and-effect relationships between Arctic and mid-latitude climates aren’t always straightforward (Overland and Wang, 2018). Rather, the linkages between amplified warming in the Arctic and mid-latitude extreme winter conditions tend to reinforce conditions caused by natural variability (Swain et al., 2016; Screen et al., 2018; Overland and Park, 2018). Therein lies the challenge facing scientists seeking to distinguish what changes in our weather and climate stem from natural variability, and which are driven by man-made climate change. Cohen, J., Screen, J.A., Furtado, J.C., Barlow, M., Whittleston, D., Coumou, D., Francis, J., Dethloff, K., Entekhabi, D., Overland, J. and Jones, J., 2014. Recent Arctic amplification and extreme mid-latitude weather. Nature geoscience, 7(9), p.627. Francis, J.A. and Vavrus, S.J., 2015. Evidence for a wavier jet stream in response to rapid Arctic warming. Environmental Research Letters, 10(1), p.014005. Francis, J.A., Vavrus, S.J. and Cohen, J., 2017. 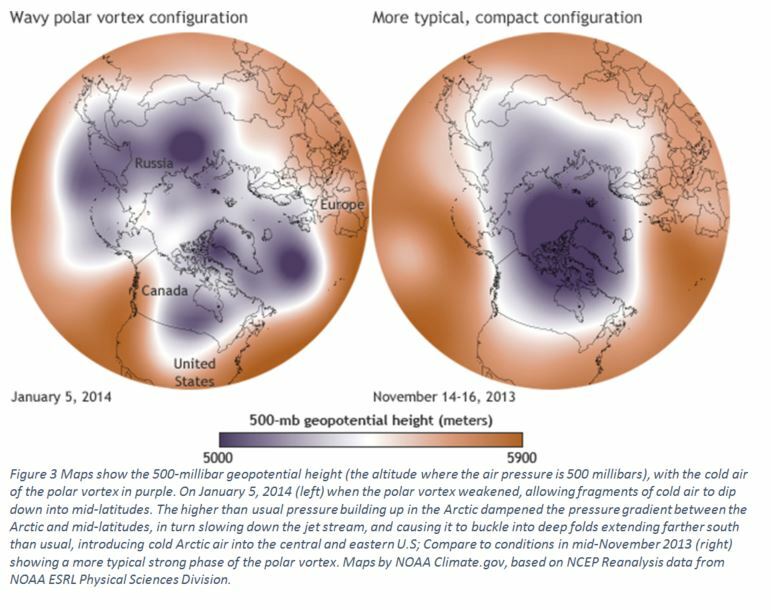 Amplified Arctic warming and mid‐latitude weather: new perspectives on emerging connections. Wiley Interdisciplinary Reviews: Climate Change, 8(5). Overland, J.E. and Wang, M., 2018. Arctic-midlatitude weather linkages in North America. Polar Science. Screen, J.A., Deser, C., Smith, D.M., Zhang, X., Blackport, R., Kushner, P.J., Oudar, T., McCusker, K.E. and Sun, L., 2018. Consistency and discrepancy in the atmospheric response to Arctic sea-ice loss across climate models. Nature Geoscience, p.1. Sewall, J.O. and Sloan, L.C., 2004. Disappearing Arctic sea ice reduces available water in the American west. Geophysical Research Letters, 31(6). Swain, D.L., Horton, D.E., Singh, D. and Diffenbaugh, N.S., 2016. Trends in atmospheric patterns conducive to seasonal precipitation and temperature extremes in California. Science advances, 2(4), p.e1501344. Trouet, V., Babst, F. and Meko, M., 2018. Recent enhanced high-summer North Atlantic Jet variability emerges from three-century context. Nature communications, 9(1), p.180.